I made cheese! That is ridiculously exciting for me. Many years ago, before children and before insanely busy schedules, and before I got tired of paying for all of the channels on cable, I used to like watching cooking shows. My favorites included The Two Fat Ladies, they were sooo funny, and the Urban Peasant because he used real ingredients that were actually in my kitchen, and Breaking Bread With Father Domenico, because it was all bread and we lived in a time when gluten was still your friend, and finally the Frugal Gourmet, I usually didn’t have the key ingredients that he was always talking about but he made cooking look fun. Except tripe, this is a tripe free house and cooking tripe would not be fun. Well I remember very, very little of most of these shows, but I do remember watching the Frugal Gourmet make actual real cheese in front of my eyes as if it were nothing. I was amazed and put it on my to do list: Someday I’m going to make cheese in my very own kitchen. Well today was the day. When I first wrote about making yogurt in a slow cooker a few weeks ago, I mentioned that once you strain your yogurt to get a thicker Greek yogurt consistency you are left with a whole lot of whey. 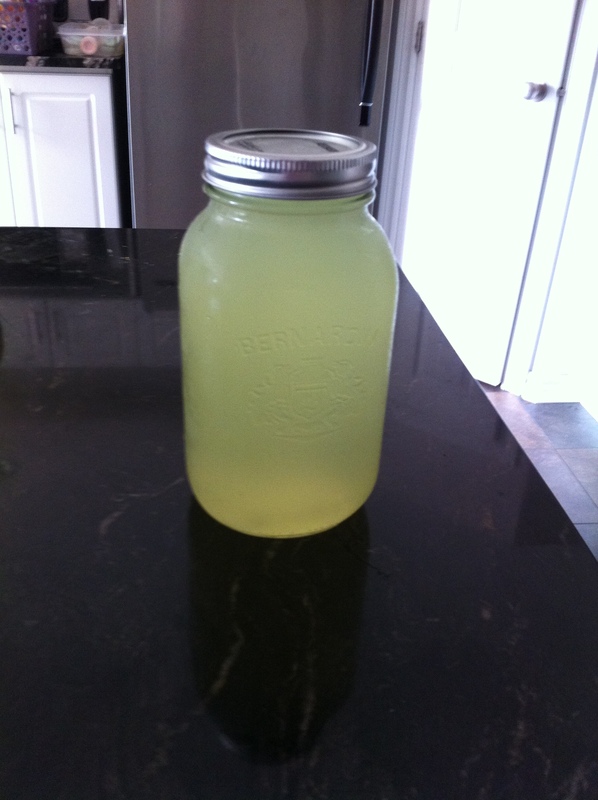 Whey can last in your fridge for a bit and you can do a web search for different uses. I used some to make pizza dough, it was delicious. But today I decided it was time to go all out and see if I could have success with ricotta. 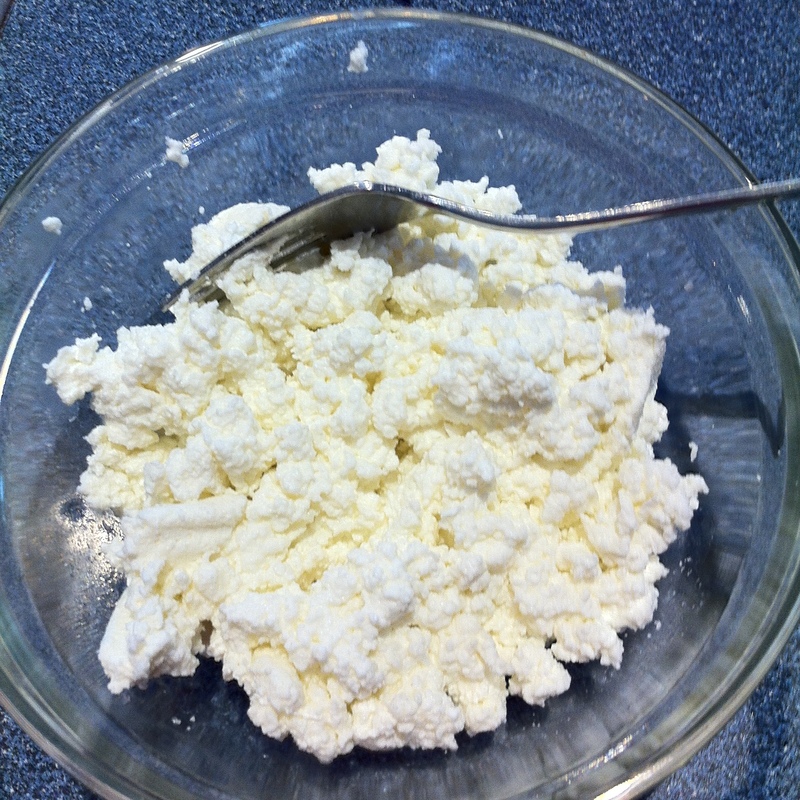 I’ve been looking at different recipes for home made ricotta cheese, it really doesn’t seem that complex or complicated. For the record most of what I’ve been doing on this blog is simple and straightforward. Seriously, if I can do it you certainly can. I went with a recipe from salad-in-a-jar.com because it only called for two ingredients: yogurt whey (I had that) and milk (I had that too!). I didn’t follow it exactly, my son made waffles for breakfast and the measuring cups were mid cycle in the dishwasher. When you are dealing with two ingredients I figure that the scope for grace is pretty large and eyeballing amounts will get you through just fine. And it did, although in hindsight I had more whey than the recipe called for and should have/could have used more milk to end up with more cheese. I had about 4 cups of whey and I used probably 3 to 4 cups of milk. 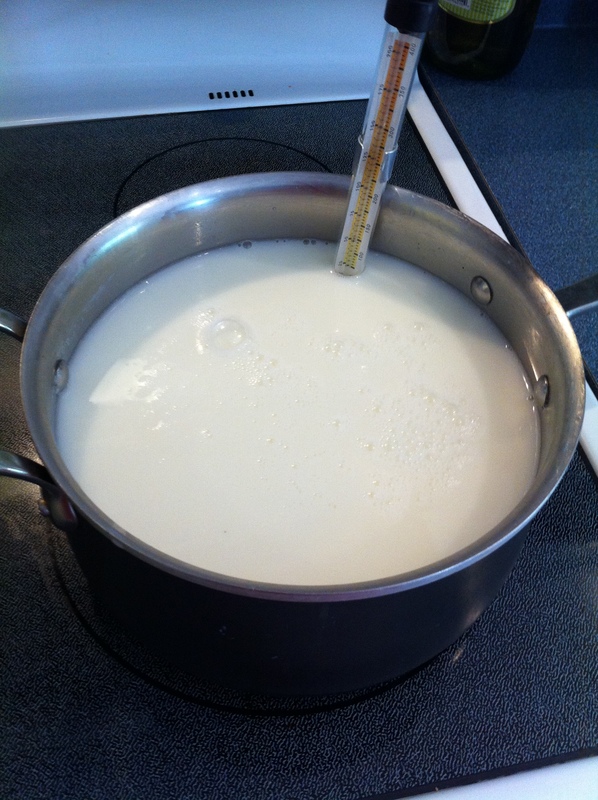 I mixed everything together in a pot, gave it a whisk at the onset and attached my thermometer. I didn’t stir it again but kept going back and checking to make sure that we got to 185 degrees and no higher. Milk and whey, whisked together. It didn’t take long for things to start happening. Pretty quickly, and quite independent of me, the proteins started to separate out of the mixture and you could clearly see them solidifying. I heated the works, without stirring until the thermometer reached 185 and then removed the pot from the heat. I let it sit for fifteen minutes while the magic continued. Total technical contribution from me: stir once, turn stove on, check thermometer, turn stove off, move pot. Yes folks it is that easy. After fifteen minutes were up I used a spoon to remove the cheese from the whey and let it strain in cheesecloth for a while. 185 degrees and time to remove from heat. Note to my friends: between yogurt and vinegar and now cheese making I am going through a whole lot of cheesecloth. Feel free to give me boxes of it for Christmas and birthdays. 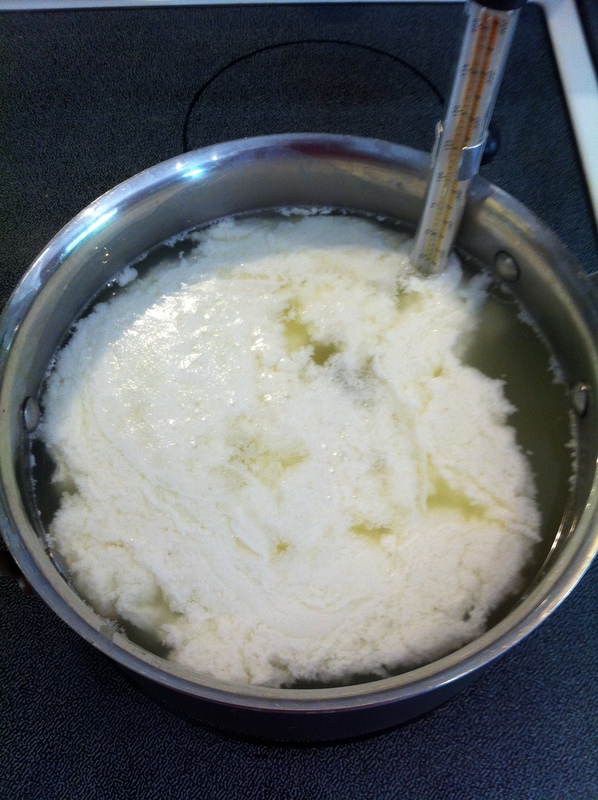 I have some extra fine cheesecloth and I used that to strain the ricotta. I tied a string around the top, hung it off of a cupboard knob, and let it drip into a bowl for awhile. 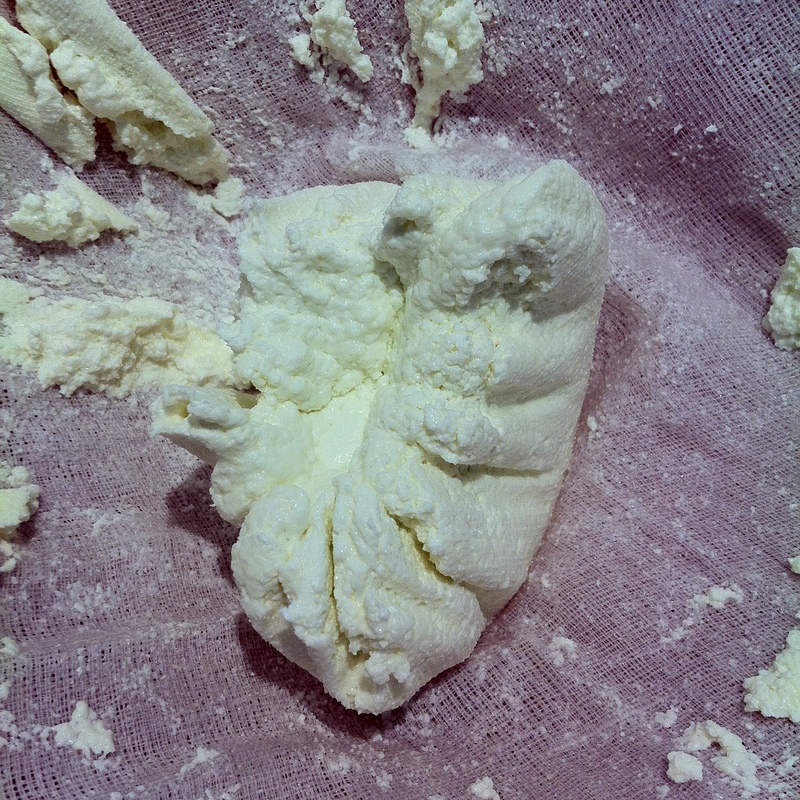 When it was done I was left with some beautiful curds which I salted and put the works in the fridge. It it supposed to be good for 4 to 7 days in the fridge. If I had used more milk and had gotten more ricotta I would have likely frozen it to make lasagna in a few weeks once the weather starts to cool. 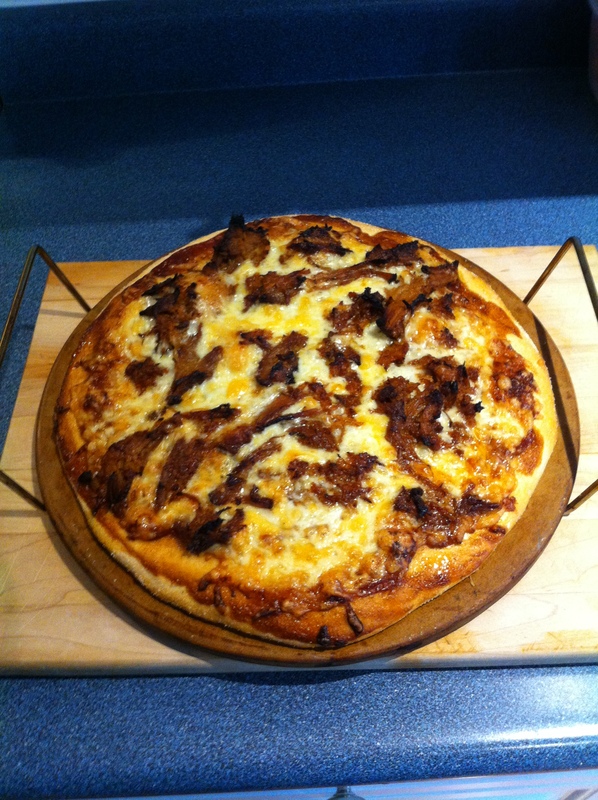 Finished product, I MADE CHEESE! I am very pleased with myself, I made cheese, it was super easy, and I might even be able to get my family to try it. Success! 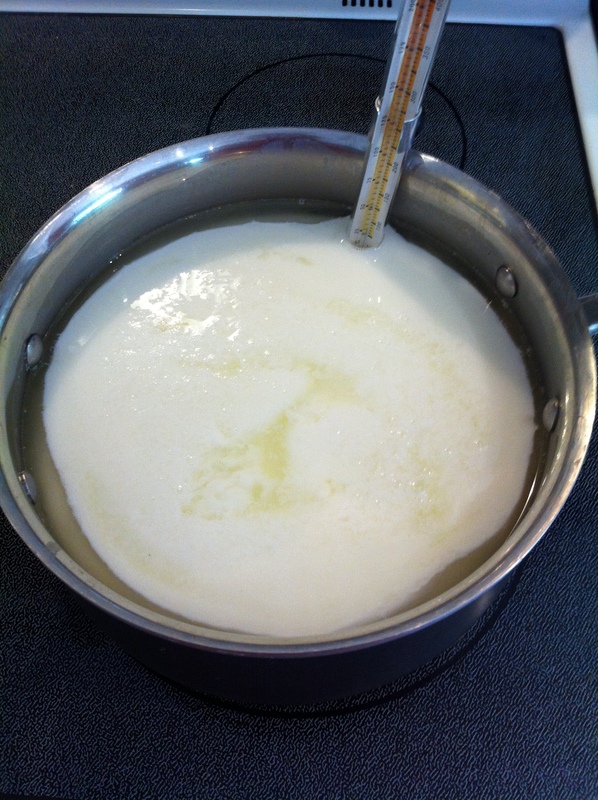 I do however have to add that in all of this yogurt and cheese making, I’m starting to feel bad for the cows. They are working pretty hard to produce enough milk to meet the international cheese pizza demands. 8 cups of milk turns into about 4 cups of Greek yogurt and 4 cups of whey at my house. 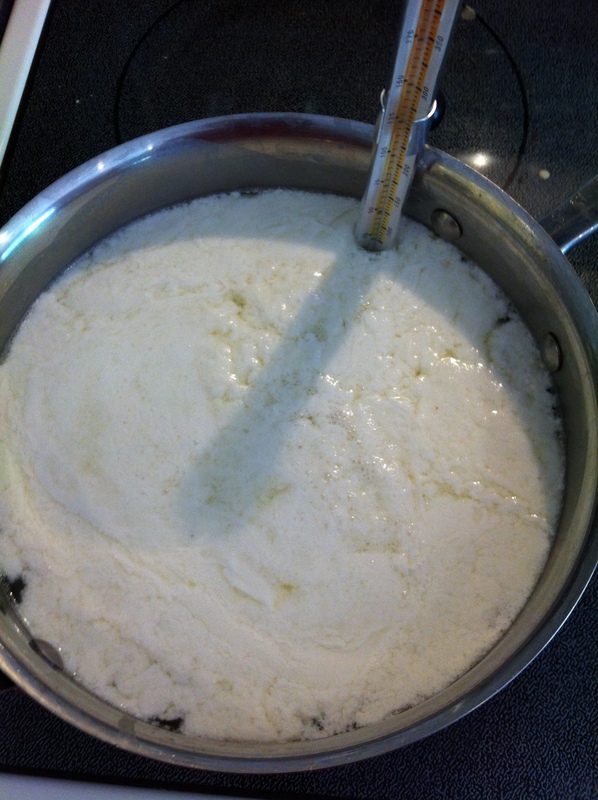 I added 3 more cups of milk t0 the whey and ended up with 1.5 cups of ricotta cheese. 11 cups of milk is turned into 5.5 cups of “food” and I’m feeling like I now understand why Greek yogurt and real, non edible oil product cheese in the store is so stinking expensive. I will be offering those hard working girls a bit more respect from now on.